What did we think? What would I change? How are the macros? All this and my family's thumbs-up rating below! This post may contain affiliate links. If you purchase through any of the links below, we may earn a small advertising fee, while nor costing you anything additional. Thank you for supporting our work in the diabetes community! Before starting low carb, I used to make homemade granola all the time. I loved the sweet-toasty-clusters of oats and nuts - and in fact, the heavier and crunchier, the better in my opinion. I even remember a few jokes about how I liked to eat nuts and twigs for breakfast. Well, maybe not twigs, but the 'nut' part was right on. So given all of that, you'll understand how when I saw this recipe for (low carb) Peanut Butter Power Granola, I knew I had to try it. Plus, since I'm planning a month-long summer (working) vacation, I'm trying to use up whatever is left in my pantry. Turns out I had plenty of various nuts for this recipe. I had all the ingredients so didn't have to buy anything! That's always such a great feeling! There are a million possible variations depending on the type of nuts / nut butter that you use. Almonds, macadamia nuts, brazil nuts, hazelnuts and other low carb nuts & seeds all will give a different taste to the final product. For a list of low carb nuts, check this out. Also, try unsweetened sunbutter if you are sensitive to peanuts. I personally used a combo of blanched and standard almonds, 80g pistachios and approx. 200g roasted hazelnuts. This recipe is easy to put together and you don't need any big, expensive kitchen appliances. I don't have a food processor, so I used a simple hand chopper like this one to process the nuts. It works really well and I was able to chop all the nuts in just a few minutes. The price. Nuts are expensive and I would hesitate to buy this many nuts for one recipe. When I was in the USA, I loved to buy almonds, pecans, and sunflower kernels (among others) at Aldi Supermarket. Also, search for sales whenever possible. It took a good 12 hours refrigerated before the erythritol sweetener taste mellowed and after that time, this granola was realllly good. Make this one ahead of time. If you try it straight out of the oven, try it again after some time refrigerated. Another option is to mix some pure stevia or pure monk fruit sweetener in place of part of the erythritol. These are not even substitutions, particularly with monk fruit. Add conservatively! Calories and fat. This is made of nuts. Almost completely. And peanut butter. While technically this is low carb, this is not a freebee and NOT something you should be loading full of cream and eating by the giant bowl full. Measure your portion size at 57 grams to match with the nutritional info below. Water down your cream slightly. Just like standard granola, serving sizes are small. This is really calorie dense. Whey protein can cause erratic blood sugar spikes in some. I prefer egg white protein powder and that's what I use. It's much more predictable! OVERALL, This granola is AMAZING!! I reduced the erythritol from 1/3 cup to 1/4 cup but the cooling erythritol effect was still really strong upon baking. As mentioned above (and again below) I felt that this effect was less after refrigerating. Next time, I'd try a different sweetener combination. I was also skeptical that this would crisp in the oven, since the mixture was a gooey mess after adding the water. Trust me, it crisps and browns beautifully. I really should never question one of Carolyn Ketchum's recipes. She is a master! 2 OUT OF 4 THUMBS UP! I have to explain this score as I don't think it's entirely accurate. My husband and youngest daughter sampled this granola when warm, straight out of the oven. Unquestionably, it was not as tasty at that time. My husband left on a business trip early the next morning and my younger daughter was not willing to try it again. I very happily ate this granola all week. I will definitely make this one again. Cinnamon or pumpkin pie spice would be an incredible addition. I also want to try with sunbutter. If you can't find a pre-made, unsweetened sunbutter where you are, follow this recipe for homemade sunbutter (you DO need a food processor for this one). 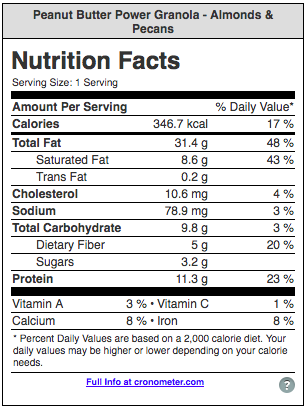 The above info is very close to the nutritional info stated on the original recipe. You'll see that they were really close - with the largest difference being the carb count rose by nearly 1g per serving thanks in part to those delicious (but carby) pistachios. Please consider supporting these amazing low carb recipe bloggers that I'll be featuring by liking their pages on Facebook, buying their cookbooks/ebooks and following their blogs. If you've tried this recipe, let us know what you thought of it in the comments below. Would you give it a thumbs up? Scroll to the bottom of this page to comment! Newer PostLow Carb Carrot Cake!